HUNTSVILLE, Ala.--(BUSINESS WIRE)-- ADTRAN® , Inc., (NASDAQ:ADTN), the leading provider of next-generation open networking solutions, today announced a new global service provider survey by Broadbandtrends names ADTRAN the top source in all categories for delivering the next-generation technology, products, services and solutions needed to help network operators build their best 10G fiber access networks. According to its “Global Service Provider Survey: 2018 10G PON Deployment Strategies & Vendor Leadership” report, 79% of carriers worldwide plan to deploy 10G PON by 2020. Additional data from IHS Markit reinforces this services trend by highlighting that 10G PON presents the highest growth engine for the broadband access equipment market over the next four years. 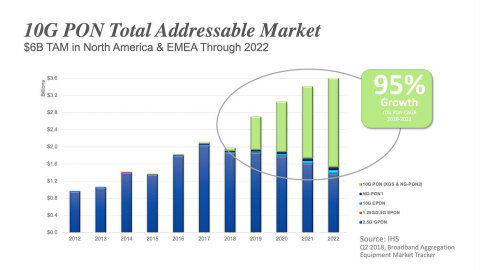 According to IHS Markit’s recently released “Broadband Aggregation Equipment and Components Worldwide Tracker,” the compound aggregate growth rate (CAGR) for 10G PON equipment will grow 95% by 2022 — generating over $6B in total addressable market in North America and EMEA alone. According to the report, as communications providers look to migrate their networks from 1G PON to 10G PON, ADTRAN’s solutions meet the deployment strategies of 100% of carriers — providing a clear competitive advantage for the company as 10G PON deployments ramp across North America, CALA, EMEA and APAC.